Jenna Elizabeth Johnson: Lorehnin Cover Reveal and First Chapter! Lorehnin Cover Reveal and First Chapter! Well, here it is! The long-awaited cover reveal for the next Otherworld installment: Lorehnin. I just read through the first chapter for the second time, and will be continuing with the rest in the upcoming days and weeks before sending it off to my editor and eventually my beta readers (so basically, don't be too terribly shocked should you stumble upon a typo or several). Lorehnin tells Robyn's story, almost two years after graduating high school and saying farewell to her friend Meghan (whom you should all know from Faelorehn, Dolmarehn and Luathara ;)). Robyn leaves her old life behind and becomes a college student, determined to make something of herself. Unfortunately, her connection to the Otherworld didn't end with Meghan's retreat into the magical realm, and her neat little plans for the future will be tested as both enemies and allies from Eile invade her world . . . As you can tell, I still haven't written the blurb yet, but hopefully you get the gist :). 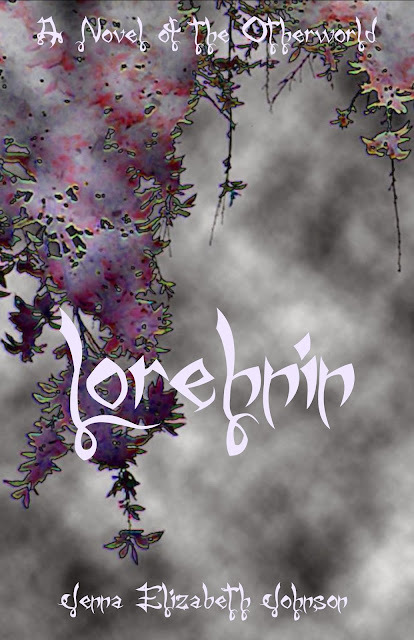 And now I present to you both the cover and the first chapter of Lorehnin. Enjoy!! I didn't hate my job at the Green Tea Leaf. Really, I didn't. But some evenings even waitressing in this little hidden gem of San Luis Obispo could be unbearable. It was Thursday night, which meant the streets were crawling with people at the farmers' market, and it was rush week. Every last perky sorority girl and conceited frat guy was out prowling the masses pressing all the young, impressionable people they saw into uncomfortable conversations complete with big, fake, bleached-toothed smiles and forced enthusiasm. And for some ungodly reason, one of these girls was pestering me. Okay, there were two things very wrong with this situation. First, I was in no way, shape or form impressionable. In fact, I think I was born with my opinions already intact. Yup, I'd been forcing my independent nature on the world even before I could talk. And secondly, anyone with half a brain could tell, on looks alone, that I was not sorority girl material. My black hair was more than a dozen shades away from being platinum blond and the streak that was currently dyed electric violet only accentuated that fact. Furthermore, if the small assortment of silver hoops in each of my ears didn't scream rebel, then my lovely little collection of tattoos sure did. They had been a birthday present to me, from me, as well as a nice way to remind myself that, thankfully, I no longer lived under the tyranny of my rigid, stodgy foster parents. That's right, the day I turned eighteen they'd met me in the living room with all my bags packed and ready to go. "If you continue to live this ridiculous lifestyle of yours and refuse to accept our rules, then we can no longer support you," my father had said as my mother watched on in stone silence. At least the woman had had the decency to look regretful. Fortunately, I'd already enrolled in classes at Cuesta, the local community college which was much more affordable than the better-known Cal Poly, and had narrowed down a few possible apartments in San Luis. Okay, they were more like economy sized closets than anything else, but they would suit my simple needs and that was all my meager student loan could afford anyway. Finding a job had been tougher. Just when my stubborn insistence to keep face started to falter, I'd stumbled upon the Green Tea Leaf and the help wanted sign. It had been a gift from the gods of outcast orphans. A bark of laughter from one of the tables snapped me back to the present and the grinning blond hovering in front of the serving counter. I arched one of my eyebrows, the one not pierced, and drew in a deep breath that I hoped would encourage patience. "So, I think you'd be a wonderful addition to Delta Sigma Lambda," the bright-eyed blond chattered. "Here's a flier with a list of our upcoming activities." Gritting my teeth and trying not to be rude, I reached out a hand and took the neon pink paper and skimmed it as the girl studied my black and silver nail polish and equally dark eyeliner. For the first time since entering the Tea Leaf her lips twitched in uncertainty. That's right Barbie, you picked the wrong victim. My eyes raced across the list of vomit-inducing social events. A barbecue with one of the frat houses, a themed pool party where the guests were encouraged to dress as movie stars from the fifties, a scavenger hunt that included visiting all the bars in town . . .
Ugh. Not a single one of these "Nights of Fun" appealed to me. I sniffed and snapped the flier back at the girl. She actually squeaked and jumped an inch. Time to turn on the famous Robyn Dunbarre charm I’d often used in high school. "Thanks, but no thanks. I'm a neo-pagan and I prefer to spend my evenings sacrificing small animals and chanting to the gods while drinking blood and dancing naked around a bonfire. Unless you have some of those activities planned, I don't think I'll be joining you." The girl's blue eyes widened and her jaw dropped open. I simply crossed my arms and smiled as she made a beeline for the exit. "Dude, Robyn," Jonathon, one of my coworkers, whispered, "I know Margie thinks you're the long lost troubled niece she never had, but one of these days she's going to hear one of your snide remarks and then you'll be busted." I snorted and tossed my hair, cut shorter than it had been in high school. Margie was the owner of the Green Tea Leaf. A sweet, middle-aged woman who enjoyed a diverse work force and supplying the local college kids with something other than fast food and alcoholic drinks to keep them energized. The Tea Leaf was an organic cafe as well as a gift and book shop, and much of its wares and fare leaned toward the more eccentric types, such as myself. "You know, what I said was only half true," I responded with a sniff. I turned and regarded Jonathon, his brown eyes skeptical behind tasteful, wire-rimmed glasses. "I don't really dance naked or perform animal sacrifices or drink blood." "Too bad," he muttered as he got back to making a cappuccino for one of our patrons. The machine hissed, blasting steam into the decanter of milk, almost covering up his next words. Unfortunately, I heard him. "I wouldn't mind seeing that . . ."
"Jonathon!" I gasped, smacking him with a towel. "There are rules in the work place about sexual harassment you know!" Jonathon’s eyes widened in shock and I could have sworn he would've fainted had I not smiled and said, "I'm kidding! I know you didn't mean it." He cleared his throat and finished up with the drink he was preparing. "Sorry," he muttered, trying to recover from his embarrassment. I reached out a hand and squeezed his thin arm. He towered over me, but then again, most people did. Jonathon, however, was a beanpole: all height and no muscle. And he was probably the only friend I had in the world at the moment, except for Margie and Kelly, the other girl who worked here in the cafe. When Jonathon gave me a sheepish smile, I turned back to my work. Now that the sorority recruiter was long gone, I went back to stocking the shelves. Most people loathed this part of working in the service industry, but to me it was a nice reprieve from dealing with the public, especially if we had recently received a new shipment of books. As the smooth new age music played in the background and mingled with the sputtering of the coffee machines and the chatter of warm, conversational voices, I let my thoughts wander. Yes, I only had my colleagues to call my true friends, but that was because those I had known in high school had either gone off to college far away from here or, in the case of my friend Meghan, had gone to live in a different world entirely, and I mean that literally. I paused in the process of placing a box of organic loose leaf tea onto one of the shelves and drew my hand down to touch the cool metal band around my neck. The necklace, well, torque technically, had been a gift from Meghan and her husband, Cade. I gave a short snort. It was still hard to think of Meghan as happily married to the hottest guy I'd ever seen. It was even harder to imagine she was living in the Otherworld, a place I'd been semi-obsessed with for years. All throughout high school I'd been the one in our little group of friends that had been into Wicca and anything pagan. Of course I had never really believed the Otherworld existed. To me it was more of a spiritual place one might be able to reach in the afterlife. Turned out I was wrong. "Robyn, could you help me at the counter?" Jonathon called from up front. I coughed and set the box of tea down. "Yeah, sure!" I answered, brushing my hands down the apron I wore. I glanced at the clock on my way through the small dining area. Ten more minutes until the end of my shift. Ahhh, bliss. Downtown San Luis Obispo was still crowded when I left work. There were always people out and about after dark, but with the new school year just around the corner, college students old and new were returning back to campus and settling in as they awaited the first day of class. A large clump of young students, made obvious by all the Cal Poly gear they wore, stood in my way. Gritting my teeth, I hiked my purse further up onto my shoulder, wrapped my arms around my torso and ducked my head, ready to burrow my way through them like a bull. I managed to escape the press of fresh-faced incoming freshman with nary a bruise nor shout of irritation thrown my way and soon I was enjoying the privilege of personal space as the crowd thinned. The night was chilly, but not unbearable. Loosening up the death grip on myself, I glanced up at the banners welcoming the students back to school, their gold and green colors warped in the orange glow of streetlights. Cal Poly was the local state college, a good school but way too expensive for my budget. Cuesta was a better fit and my student loans took care of most of it. What the loans didn't cover I had to work for, hence my job at the Tea Leaf. I was all on my own after all, no proud parents willing to sacrifice some of their spending money so their daughter could improve herself by earning a better education. I guess if I fit into their image of a perfect child, my foster parents would lend me the money I needed, but there was no way in hell I was going to change for them. Not because I was stubborn or that I thought their own beliefs were ridiculous. That wasn't the case, though they would never believe me if I told them so. They thought I was a lost soul and the only way for me to be saved was to cast aside my 'sinful and heathen ways'. Unfortunately, that's who I was. I knew deep down in my soul that their way of life wasn't the one for me. I only wished they could see it too. Sighing, I tossed my hair over my shoulder and turned down a familiar alley. My house was only six blocks from the Green Tea Leaf, but that distance was cut in half if I took a few short cuts and I had left my bike at home this morning. Okay, technically it wasn't my house. I rented out the basement apartment from the four girls that lived in the main building. The space was small, but I made it work. I had a bathroom with a shower, a spacious living room and a kitchenette off to the side. I'd taken down the doors to the closet to convert it into a bedroom of sorts. My twin bed fit inside the alcove perfectly and a set of drapes closed it off from the living room. Heck, it wasn't a four star hotel but it was home. I took one more street past one of the local high schools and spilled out onto a quiet street decorated with a variety of Victorian era houses, all of them in different states of decay. None of the buildings were completely derelict, but a few of them could definitely use some fresh paint and a garden renovation. A common problem in a college town. The house I lived in was toward the end of the street, a pink, two-storey structure complete with lacy molding around the windows and a covered front porch. My roommates, well, housemates really, must have been throwing a party because the door was wide open, the lights were on and rap music was blaring from the windows, making the panes of glass rattle inside their frames. Three guys holding red plastic cups, undoubtedly full of beer, laughed and conversed on the path leading from the gate. I cringed as I passed by them since every other word of the conversation was an f-bomb. Lovely. Made one question a society's education system. Fortunately, the three vocabulary-challenged party-goers didn't notice me as I bypassed the porch and headed for the side of the house. The door to my basement apartment was sunken into the side of the building and framed by an arbor of clematis. The flowering vine, along with the side garden space, was what made me choose this apartment above all the others when I'd first looked. There had been a few more that had extra space in them for the same rent, but none of them featured a place for planting flowers, herbs and vegetables, many of which were currently on the verge of being ripe. I didn't hang out with my Wiccan friends from high school anymore, but I still needed that connection with the earth and growing things. Breathing in the muted scent of flowers and spicy herbs, I let my purse drop from my shoulder. I dug around for my house key in the semi-dark, gritting my teeth against the pounding music and continued crude conversation on the porch above me. A rustling in the bushes at the edge of the yard drew my attention away from my task the way a gunshot spooked a horse. The house sat not too far away from the dead end of the road, where the land sloped downward into a small ravine. A seasonal creek cut through the gap and ran behind the house. Above the creek an old road bridge stretched across the breach, creating a popular campground for some of the homeless people who called San Luis Obispo home. In my experience, most of them were harmless and usually kept to themselves. Unfortunately, there were still a handful who were dangerous. Drug use and mental illness combined with desperation often stripped people of their humanity. I hoped that the disturbance I'd heard just a few feet away wasn't someone looking for an easy victim. Whatever had been moving in the bushes stopped and I quickly got back to my task of hunting for my keys. Probably just another stray cat or dog . . . A moment later my hand swept across something hard and metallic. Aha! There they were! Before I could so much as pull my keys free, however, something crashed through the shrubs clogging up the end of the street about fifty feet away. I jumped in surprise and dropped my bag. One of the homeless men who frequented the campsite beyond the end of our street stumbled onto the pavement, his arms and threadbare jacket wrapped around something. I squinted my eyes and tried to make out his features in the faint glow of the street lamp. Despite his dirty clothes and shaggy hair and beard, I recognized him. Jerry, an older man who had been living on the streets probably as long as I'd been alive. I had talked to him from time to time and discovered that he was one of the kinder people who shared our city. In fact, seeing him now, clearly trying to escape while hiding something, worried me. As far as I knew he wasn't into the drug scene and he didn't waste what little money he managed to scrape together on alcohol. He did, however, have a soft spot for the local stray dogs and cats, and that, at least, I could sympathize with. Forgetting my desire to get inside and catch up on my favorite TV shows with a nice mug of tea, I turned back toward the street and headed to the edge of our fence. At first Jerry didn't hear me. He looked pretty distressed and my concern spiked. This time he jumped and turned to consider me. The fear and anguish in his eyes melted away, but perhaps that was just the tears gathering in their corners. "They got the rest of the litter," he rasped in that gravelly voice of his. "They got the litter, and the mama cat." Carefully, he pulled back his jacket and drew his arm out, two tiny kittens in his huge hand, both pale in color. Suddenly, a bad feeling fell over me. "Who has the other kittens?" I asked. "Them punks who come down and try to take my Maggie." Maggie was his dog, another stray he had taken in to keep him company. What meager change he managed to coax out of the kindness of strangers he mostly spent on food for her. "Wh-what do they want to do with them?" I murmured. I had moved beyond the fence and was now much closer to Jerry. "They is in some kind of cult. They, they . . ."
He trailed off, but he didn't need to finish. My heart dropped into my stomach and my skin began to prickle. I had a pretty good idea what kind of cult he was talking about. "Jerry, stay up here, I'm going to go check it out." He shook his head vigorously, but I pulled out my cell phone. "I'm just going to look. Maybe it isn't what you think. And here's my phone. If it looks dangerous, I'll come back up here and call the police." Jerry pulled the two kittens back in close and shuffled off to the side of the road. Taking that as a sign to proceed, I headed toward the end of the street. Yes, it was unwise of me to approach a gang of sadists who were probably getting their kicks by torturing a cat and her kittens, but the raw anger that boiled up in me refused to let it go. I doubted a petit girl of five foot two could intimidate them into finding a less cruel hobby, but I had to try. I had my waspish personality to arm myself with, after all. When I reached the end of the street, I could just pick out the low voices of a few people muttering. No, not muttering, chanting. That was odd. Most bored teenagers who took up animal cruelty in groups thought their actions were so hilarious. I expected cruel laughter, not soft chanting. Feeling a little bolder, I squeezed my way past branches and leaves and had to brace myself a few times as the rudimentary trail shifted downward. A minute or so later I spotted the site where many of the homeless camped, a cleared out patch of land tucked beneath the street bridge and above the shallow creek. What I saw next made me draw in a sharp breath. Five figures, all dressed in black hooded sweatshirts with the hoods up and cinched tight around their faces, stood in a circle. In the middle of the circle there appeared to be a small fire pit constructed of stone. Instead of flames crawling around inside the stone circle there was something else . . . kittens. A harsh yowl from the bushes told me where the mother was. My heart clenched and I gritted my teeth. Poor things. The chanting stopped and I returned my eyes to those surrounding the fire pit. The lighting down here wasn't that great, but there was enough streaming down from the road bridge above to make out a few details. Their sweatshirts were all the same, black with a large, silver reverse pentagram emblazoned on the front. Someone pulled out a cigarette lighter and a clump of something that looked like dried sage. And that's when I figured out what I was dealing with. Wonderful. A group of neo-pagans who preferred to focus on destroying the gifts of nature instead of rejoicing in them. I was ninety-nine percent certain that these lunatics weren't really pagan at all. They just used the label as a cover for their carnage while making the rest of us look bad. Silver flashed and I realized that one of them had a knife. Okay, things were getting serious real fast. Time to climb back up to the street and call the cops. I didn't want these sick bastards seeing me. I shifted my feet so I could turn around and head back up the trail. Unfortunately, my movement caused a large rock to come loose from its resting place and slide down the hill. The five dark figures forgot about the squirming kittens and turned to stare directly at me. Well, at least I thought they were staring at me. Hard to tell with those dark hoods pulled up over their heads. Not bothering with stealth, I bolted forward, digging my feet into the loose sand of the steep trail and using the roots and branches on either side of me to heave myself upward. The loud crashing of breaking foliage behind me announced their pursuit and my heart kicked up its pace. Would these people be bold enough to murder me? Did they want to risk being caught by the police? Did they care? Panting, I pushed myself harder. Almost to the top of the trail, almost . . . A hand grabbed my shoulder and I caught a quick glimpse of a tattoo between the thumb and index finger. A skull with goat horns and sharp, elongated canine teeth. The symbol was familiar to me, but before I was able to recall anything else about it, the fingers tightened, digging into my skin and I felt myself being yanked backward. I couldn't freeze. If I froze, then these people would have me and goodness knows what they'd do to me. Of course, I couldn't help the small cry that escaped my throat either, but in the end I think it helped me. My attacker eased up a tiny bit and I took advantage of the moment by lifting my leg and kicking back as hard as I could. My foot made contact with something soft, the person's stomach or groin. I was hoping for the latter. Either way, his hand dropped from my shoulder and I could hear him falling back and crashing into his friends. I dug my toes into the steep trail like a mountain goat and pushed with all my strength. By the time I stumbled out of the brush and onto the street, I was shaking and nearly stumbled over my own feet. Jerry came shuffling over, still holding the kittens. "You okay?" I gasped and continued to head further away from the end of the road. Nodding, I breathed, "I think so. I'm going to call the police, though. Not sure if the kittens got away. Hopefully I distracted them long enough." Jerry looked nervous and I couldn't blame him. The police officers might push him out of the place he called home. I really didn't want to go through the hassle of filing a report, but maybe it wouldn’t come to that. I pulled out my cell phone and dialed the number. When I got someone on the line, I told them that I saw a group of people going down into the homeless camp near my house and that I thought I saw them carrying knives. Not a complete lie, but it might encourage the cops to look into it. Hopefully that would scare the bastards away and I wouldn't have to get any more involved than I already was. I hung up and moved closer to my basement apartment. If those idiots wanted to come after me, they'd have a hard time doing anything with the party raging in the house. Five minutes later a police car pulled around the corner making my roommates' guests scatter like cockroaches. The car rolled up alongside the sidewalk and I stepped out of my basement room. Jerry had long since disappeared and I'd decided to play it safe by locking my doors. I had spent the time it took the cops to get here thinking about that tattoo. Back when I was still regularly attending outings with my Wiccan friends, they had warned me about a small gang around town who liked to dabble in black magic. They called themselves the Noctyrnum and frequently practiced animal sacrifice. And it was people like them that made ultra-religious people like my foster parents equate "pagan" with "devil worshipper". And that tattoo on my attacker's hand was the spitting image of the small, black symbols I'd seen painted in random places throughout San Luis. "Noctyrnum," Claire, the founding member of our group, had said with a grim expression. "Do not mess with these guys. They make the wannabe vampire crowd look like little girls having a tea party." That had been over a year ago, right after I’d moved up here and enrolled at Cuesta. At first I had been a regular member of Clair’s pagan group, Earth Bound, but eventually school and my job got in the way. Gradually, my attendance tapered off until I stopped going altogether. It had been three months since I'd last made it to a meeting and as I thought about that tattoo and what I'd say to the police, I realized just how much I'd missed going. Maybe it was time to get back in touch. Sighing, I walked down the narrow strip of concrete that stretched from my door to the sidewalk, my senses on high alert for any sounds coming from the bushes at the end of the street. The window of the police car rolled down as I approached. "Were you the one who called in gang activity in this area?" the officer asked. I nodded. "At the end of the street." I pointed to where the asphalt came to an end some fifty yards away. "A group of young adults dressed in black and wearing hoods went down that way. I thought I saw one or two of them with a knife and I know that some homeless people sleep down there sometimes. I was afraid they were planning on hurting some of them." The officer turned his head and said something to his partner, then looked back at me. "We'll check it out. You can go back inside now." "Thank you," I said as they turned off their car and started to clamber out. Once back in the relative safety of my apartment, I put a kettle of water on the stove and prepared a pot of tea. While I waited for the water to boil, I pulled my curtains to the side and watched as the officers' flashlight beams disappeared down the trail. Good. That should scare them off, at least for tonight. If I was lucky, that would be the last I'd ever see or hear of them in this area again.